The New Holland redesigned T8 is built for the way you work. Growing production demands, resource challenges, labor shortages, weather uncertainties… these are just a few of the obstacles you face every day. You need a dependable partner in the field to help you simplify things. One that knows your operation inside and out. That connects you effortlessly to real-time resources and insights. That adapts to the way you work… not the other way around. Customizable Control— When the time comes to deliver precision results in the field, there’s no room for a “one-size-fits-all” approach. Every operator has their own unique preferences and requirements with their IntelliView display. So, we built your controls package around the revolutionary idea that custom adjustments should come standard. Variable hydraulic technology lets you control all eight remote valves from any of 15 in-cab hydraulic buttons. Up to nine configurable buttons let you customize armrest controls to the operator or the task at hand. Improved Visibility— Whether you’re in an open field or on a busy road, awareness of your surroundings is essential. We’ve reduced in-cab obstructions, placed your InfoView™ monitor in direct line-of-sight and even installed a nose mounted camera and a rear facing camera for road safety and in-field work. Welcome to your new horizon. Additional cab lights and controls let you configure custom lighting patterns, choose from three different lighting packages and turn night into day. Redesigned cab and instrument layout provides you with nearly 360-degrees of visibility. Strategically placed cameras offer additional safety, visibility and peace of mind. In the field or on the road. Enhanced Comfort— With all the hours you spend in the field, shouldn’t work feel a little more like home? We think so. That’s why we’ve added more accessible storage, power ports, HVAC vents, egress lights and the most comfortable seat outside of your living room. Multi-zone HVAC system ensures optimal comfort, control and visibility no matter the climate or season. Redesigned SideWinder™ Ultra armrest offers multi-directional, independent motion to provide nearly infinite comfort configurations. Advanced Support— When there’s no time for “downtime,” you need a tractor that measures productivity and precision in seconds and inches. 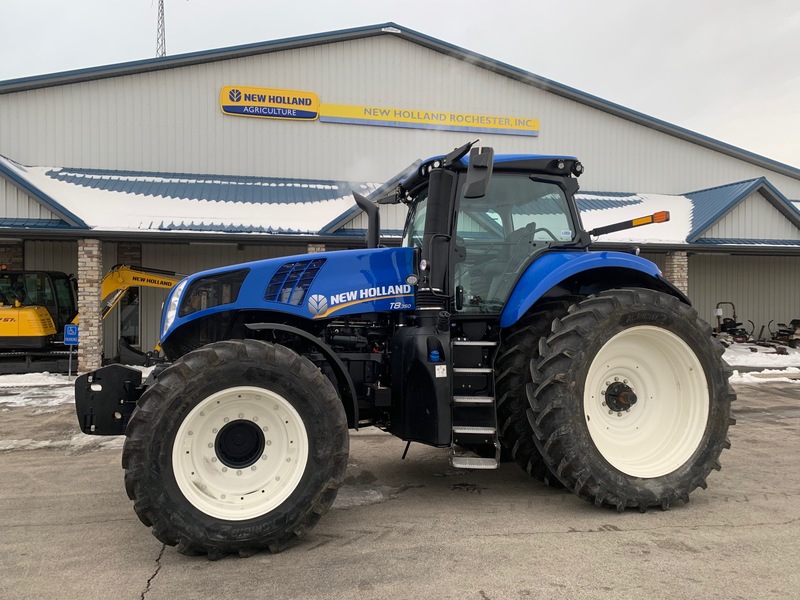 We engineered New Holland Remote Assistance to provide remote connectivity, advanced diagnostics, and remote display viewing whenever, and wherever you need it. Customer-to-Vehicle connectivity allows you to run your farm business from the cab, the farm office or the other side of the world. 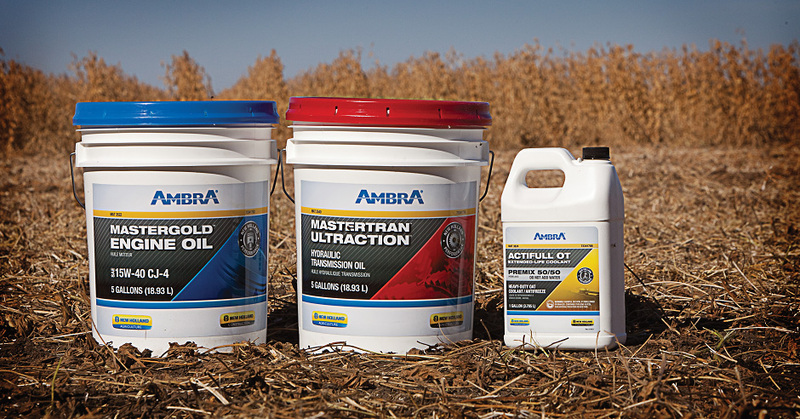 Dealer-to-Vehicle connectivity helps you minimize downtime with proactive support, remote monitoring and diagnostics, and in-field software updates. Advisor-to-Vehicle connectivity lets you stay in touch with nutritionists, agronomists and other experts to improve decision-making on the move. Intuitive Simplicity— True innovation doesn’t require an advanced degree to operate. To help you harness all of the powerful features and technologies built into the new T8, we developed a user-friendly interface that feels as natural and instinctual as agriculture itself. Improved button orientation and handle ergonomics put precision command in your hands. Enhanced joystick design lets you control tractor transmission functions as well as hydraulic remotes. Bluetooth connection allows you to control phone and radio through armrest or display. Easily split screens, expand tiles, and set up tasks right from the homescreen on the new IntelliView 12™ in-cab display. Open House is the best time to buy twine for the upcoming hay season. 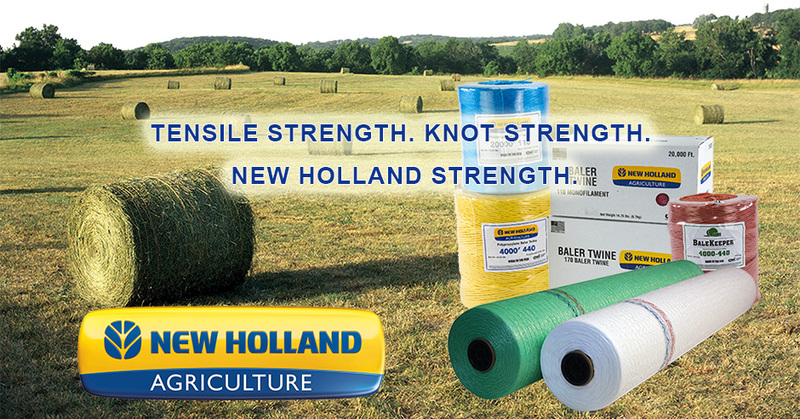 The New Holland plastic twine we offer is produced in facilities which are ISO 9001:2008 and ISO 14001:2004 certified, and are made in the USA. 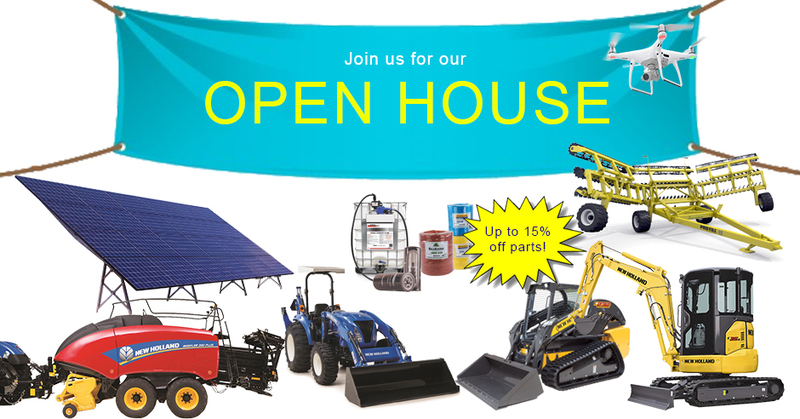 Contact our parts department for full details on Open House parts specials! Our annual Open House season is quickly approaching. Open House has always been our customer appreciation day. Along with providing a free meal, giving away door prizes, and showcasing the latest offerings in farm equipment and technology, we will be offering some of the best parts discounts of the season on all our brands! Feel free to contact us at anytime for more information about any of our events. We hope to see you soon!